All 527 alignment maps Sabal Trail filed with FERC in April 2016, in small, big, huge, and PDF formats, courtesy of Lowndes Area Knowledge Exchange (LAKE). Sabal Trail has also filed various smaller updates since then. 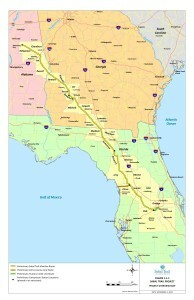 A few of them have been published by WWALS Watershed Coalition, and the portions of the pipeline path nearest the Georgia-Florida border have been digitized; see Sabal Trail maps digitized. All the maps below are OLD and in many places the route has changed. 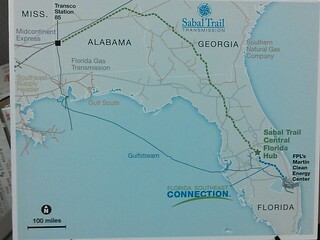 Sabal Trail’s 2 April 2014 alignment maps. The other two pipelines (Transco’s Hillabee Expansion Project and Florida Southeast Connection) did not submit maps on that date. The maps on Sabal Trail’s own website are those 2014 maps, which means they are old, out of date, no longer accurate. Seen in earlier Sabal Trail meetings or in the media. This project needs to take an alternate route.